Darrell Smith. From Connersville News Examiner. Posted on Nov 22, 2016. Original article. One trait of farmers is if one is hurting, the others will come to their aid. That spirit shown as brightly as Saturday morning’s sun when combines, semi-trucks, pickup trucks and grain carts arrived at the Steve and Carmen Wollyung farm to finish the harvest. 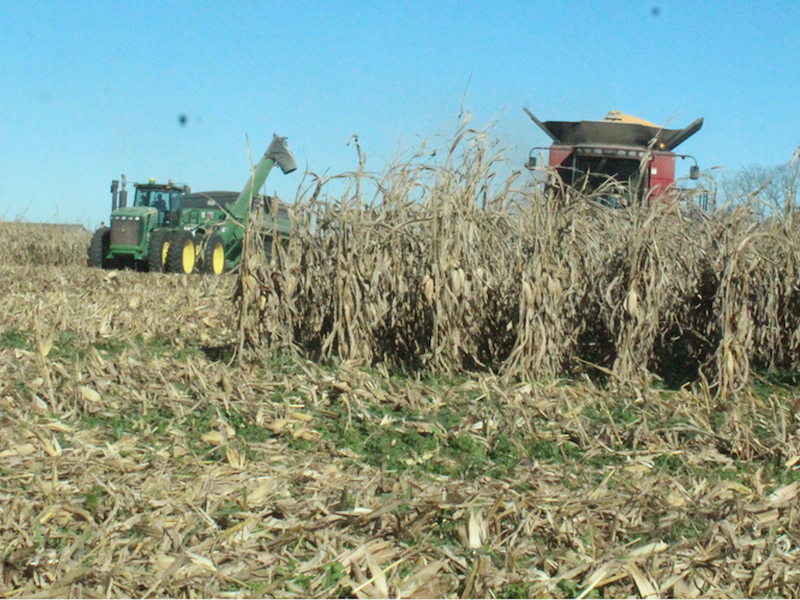 Wollyung had a little more than 110 acres left in the field to finish his harvest. Steve’s granddaughter, 4-year-old Ayla Wollyung, died in a farming accident on the farm just east of the Fayette-Union County line Nov. 5, 2016 when trapped in moving grain. The turnout Saturday morning only continued the support the community has shown the Wollyung family all week. A large turnout arrived at the Union County Courthouse in Liberty for a candlelight vigil Wednesday and another large turned out for the calling at the funeral home Thursday. A Go Fund Me account has raised $23,466 to go toward funeral expenses. Dan Weiler and Tara Henry led the effort in contacting. As with situations like this, once area farmers learn of the need of friend, they respond. He learned of the death late Saturday night, Nov. 5, with a call from Henry, and the next morning Carmen called saying help would be needed, Weiler recalled. Monday he spent with Wollyung who wanted to be involved when the friends came for the harvest. Henry’s job with the Department of Agriculture is management so she was given the task of organizing the effort, he said. Keith Barrows at Consolidated went out of his way to help so the volunteers could get the corn out of the field. Keller pointed out there were trucks, combines and grain carts in the field but farmers north of Hagerstown stood by with trucks if need. Wollyung had supplied calves to the Hagerstown Junior-High School Ag Department to make use of some rough land owned by the school. The department raised the cattle that were butchered for use by the school, saving the school money in the cafeteria, he said. That program made national news. HHS Ag Teacher Nathan Williamson, who previously taught at Connersville High School, brought his semi to the field, he said. Wollyung is such as hard-working guy who would do anything for his friends, Weiler said. He earned the River Friendly Farmer Award for his conservation efforts to prevent runoff from his farm which lies close to Brookville Lake. The cattle group is buying sandwiches for the workers and someone had purchased doughnuts and supplied coffee. Someone else is supplying chips, he said. Consolidated Grain & Barge was going to be open Saturday but promised to stay open until the harvest is done. “We had a meeting at Consolidated one morning and organized it,” he said. Gary Groves, Steve Branson and Larry Orr provided combines with Jeremy Henry operating Wollyung’s combine. Henry brought his grain cart. Chris Westover, Williamson, Timothy Hofer, Donnie Myers, Tom Rohe, Rose Farms and others supplied trucks to haul to the elevator and several farmers also brought grain carts. Saturday morning the activities in the field were filmed and will be distributed to show how an accident impacts a farm family, Tara Henry said. Those filming will talk to other farm families who have been through similar situations so that a big impact can result from a tragedy, she said. When grandchildren come visit the farm, they love getting out there on the equipment and play but it can be dangerous, Henry said. Wollyung rode is his combine with Jeremy Henry at the controls in a rough field to make sure Henry knew the dangerous spots. “It’s been one of the worst weeks of my life,” Wollyung said. He said Carmen had been talking with Tara and Weiler so he knew the farmers were coming to help. He didn’t want anyone bringing a combine into a field near the lake because it was so rough and could damage the equipment without knowledge of the ups and downs in the field. When the farmers came and began working, as he stood outside as Henry took his combine into the standing rows, he realized it may be the first time someone else has been in the seat. Friends, prayers and Carmen will help Steve through, Weiler added. “When you witness something like this, with all the turmoil in the world going on right now, it makes you glad you live in Fayette County,” Keller said.